Everyone in the ukulele world is so nice. These two are no exception. Cousins Nancy & Pearl make up the Mersey Belles. 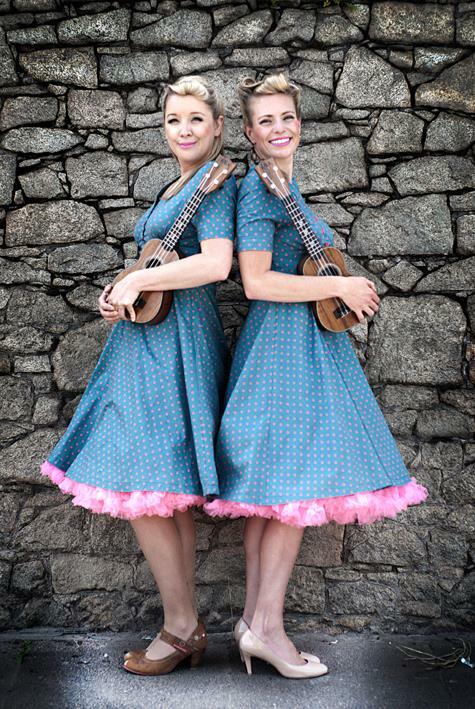 They are a ukulele act, but quite honestly, much of their talent is not their ukulele playing, but their close harmony vocals. When you first hear and see them, you think they are a 40s tribute act, but far from it, they add their own spin to contemporary and ukulele standards. Those songs you've been singing in your ukulele group have never sounded so good. Or looked so good, with some gentle choreography and moves. I've attended a workshop with them too. Here, they explained how to excercise and project the voice and for me, one particular song I was struggling with they answered the problem. "Change the key to 'A'", Pearl said to me. "Try it." I did, there and then, and one note that I couldn't reach after a long line without a breath magically worked! I'm not sure who was more pleased as Pearl gave me a big hug of congratulations. They were genuinely pleased for me, which tells you something about the type of people they are. Seen at many ukulele festivals around the UK, and sometimes touring, take a look at their website and see if you can catch up with them, too.